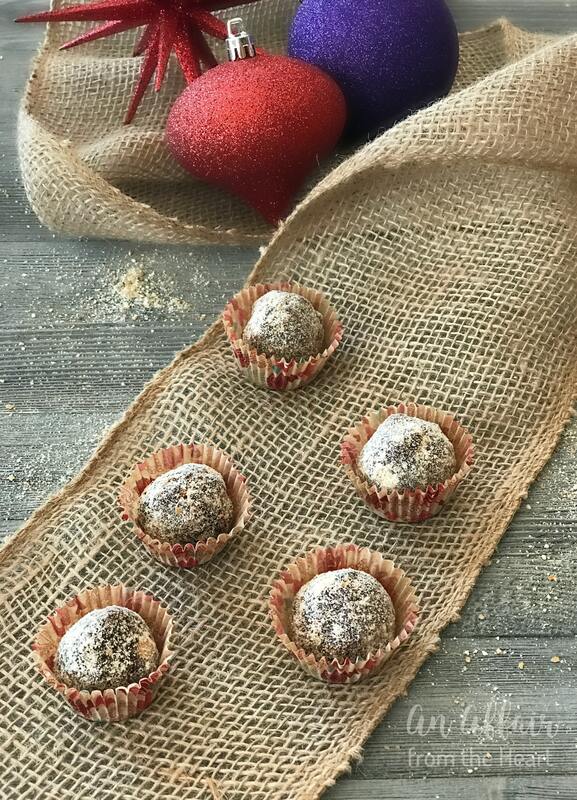 These nutty vintage holiday treats are made of almonds, chocolate covered coffee beans, spiced rum and vanilla wafer cookies. Simply roll them into balls and plate them. No baking required! The holidays are upon us. It’s officially the first of December, and time for all of the holiday fun to begin! Shopping, wrapping, decorating and baking to just name a few. Do you do a lot of holiday baking? I try to make everyone’s favorites, as to not leave anyone out, and that, well, that gets time consuming. That is why, no bake holiday treats are awesome to find! For many many years I hosted a cookie exchange with my girl friends. Then lives continued to get busier, mine included, and the last couple of years, I didn’t have one. 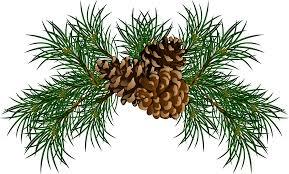 What I did have, however, was a virtual holiday cookie exchange with some of my favorite blogger buddies. It’s time for the Freaky Friday Virtual Holiday Cookie Exchange! A few weeks ago, we were assigned each others’ blogs in secret to bake from for our virtual holiday party. Today is the day that we reveal our recipes and who we were assigned! 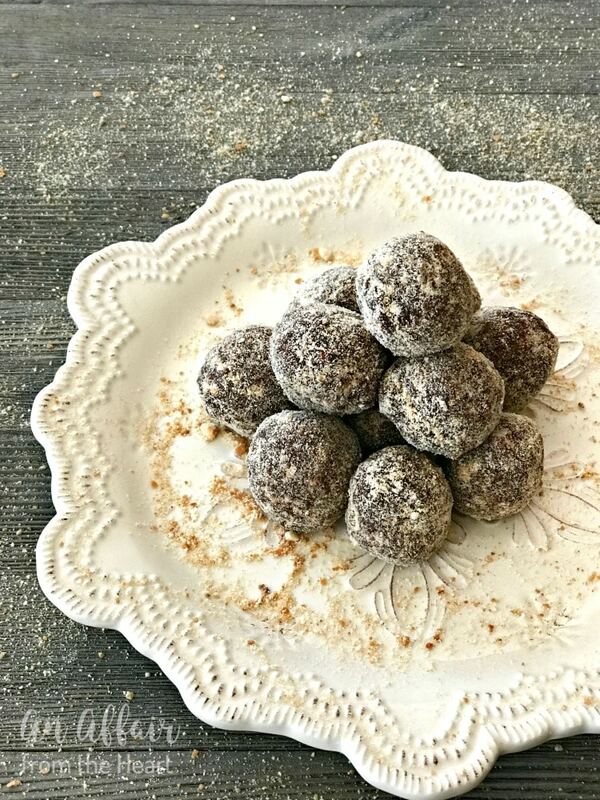 This Mocha Rum Ball Recipe came from Michele, the writer and recipe developer at BaconFatte. This is Michele’s first time joining our group for Freaky Friday! I fell in love with Michele’s website from the moment I “met” her in the online food blogger world. She makes some amazing dishes! I am always drawn to her Seafood dishes, like this Linguine with Clams or her Sheet Pan Shrimp and Roasted Vegetables — her dishes look like something you would see in a magazine! Even though Michele made this Berry Citrus Fizz Cocktail in the heat of the summer, I think it would be fantastic for holiday toasting, don’t you? Michele lives in Minnesota with the love of her life, her husband, Rick. They spend their summer days on their sailboat, and she posts the most gorgeous sunset photos! Her blog is all about homemade. We all can agree, Home Made is just better. I hope . you take the time to go follow along with her on her blog and her social medias. On top of being an amazing cook, she is a brilliant writer, photographer and all around sweetheart of a person! I will be honest with you. I have only ever had a Rum Ball once in my whole life. Years ago, someone brought them to a cookie exchange I had. I remembered them being very boozy. These are not like that. If you love nuts, these are going to be a special treat for you. I could even go so far as to say you might “go nuts over them?” — har har. 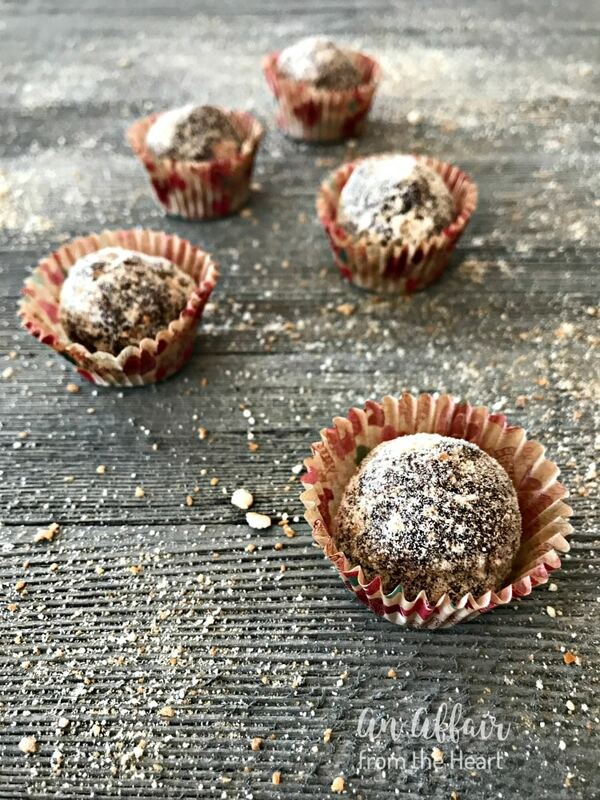 When Michele made hers, she rolled the balls in cocoa powder, but she suggested rolling them in cookie crumbs. I loved the sweetness it gave the outside. Your food processor or food chopper will be your best friend when you make these. They are so simple! Vanilla wafers, almonds, cocoa powder, chocolate covered espresso beans and powdered sugar. Besides changing the cocoa powder on the outside I changed one other thing. I changed the almonds. At first, I wasn’t going to use almonds at all. I planned to use walnuts. Mainly because I have a brand new, gallon sized bag of fresh walnuts from my cousin in California. 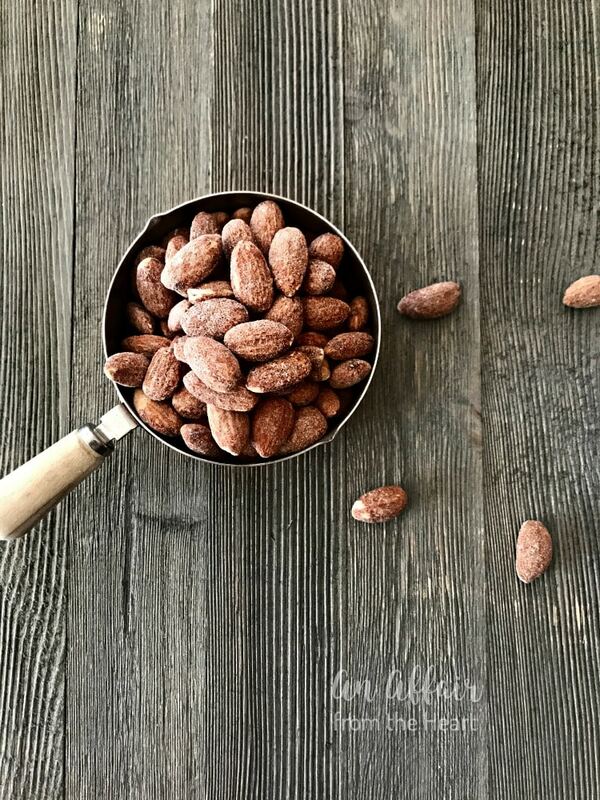 BUT when I opened my pantry I saw these toasted coconut almonds and knew that was happening. These babies are GOOD. 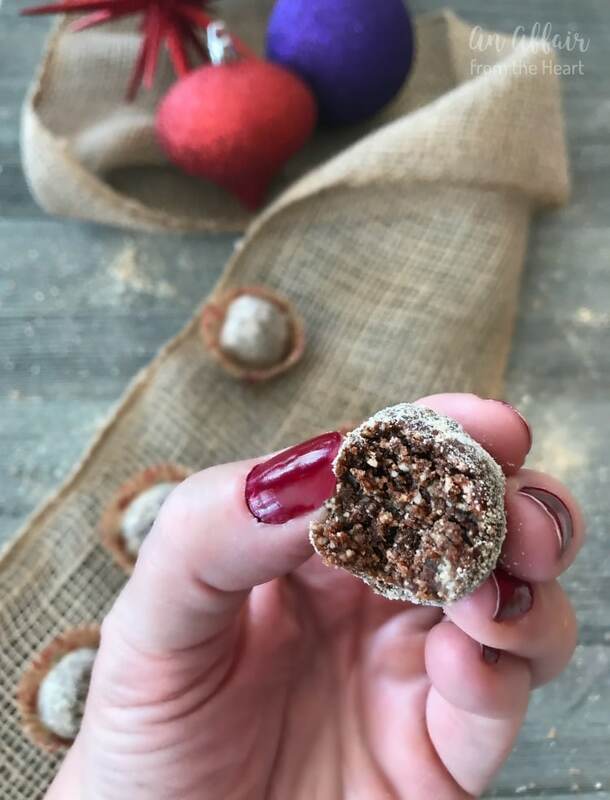 They aren’t overly sweet and they aren’t powerfully coconutty — but they gave the Rum Balls just a subtle hint of that coconut flavor. The only other thing, besides the rum of course, binding them together is a little raw honey. Also from my cousin in California. Isn’t she amazing?? Rolled in some crushed Vanilla Wafers, plated and ready to eat! Aren’t they pretty?? Or if you want to package them in cute little paper liners and place them in a box or cookie tin, they would be perfect for a cookie exchange! There are sixteen of us participating today in the cookie exchange. I am so excited to share with you what everyone made!! I coated mine in crushed Vanilla wafers. You could also coat them in cocoa powder, powdered sugar or dip them in chocolate. Using your food processor, grind up the almonds until they resemble the texture of fine sand. Do the same to your cookies and your espresso beans. 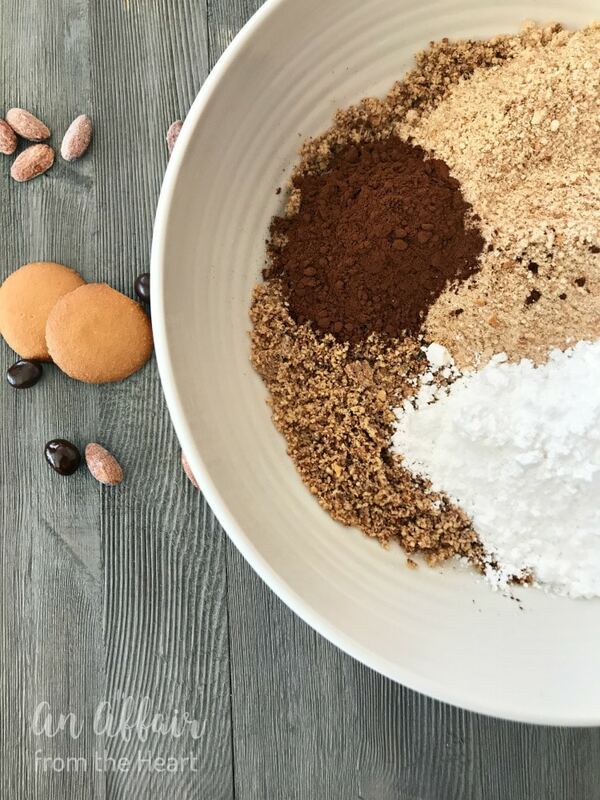 Combine them in a bowl with the cocoa powder and powdered sugar. 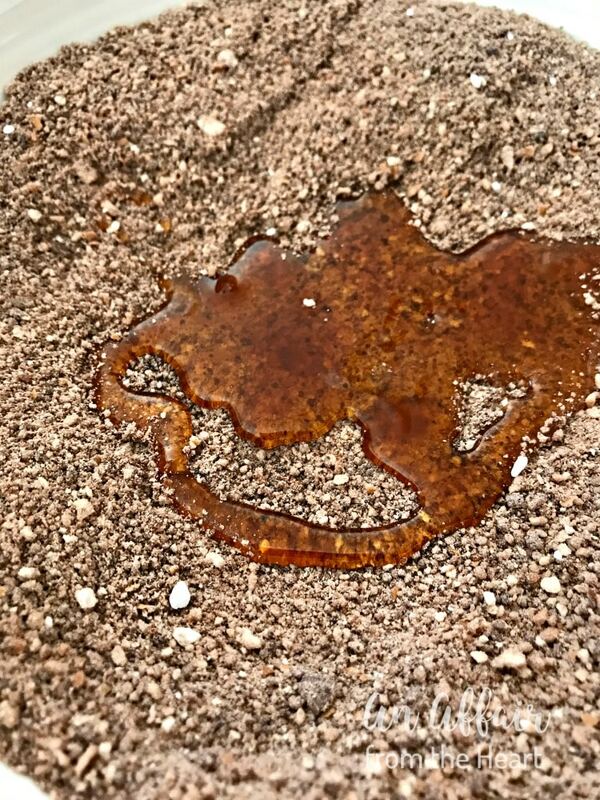 Pour in the honey and the spiced rum. Using a fork combine until the dry mixture is all moistened. (kind of like making a graham cracker crust) If you need to, add more rum to get it to the right consistency, add it by teaspoonful until it's okay. Scoop the dough with a small cookie scoop and form your balls. Immediately roll them in crushed cookies. (or whatever coating you choose) so that the coating adheres. Store in an airtight container in the refrigerator for up to two weeks. You had me at Chocolate Covered Coffee Beans! These look great! HA! We had a similar idea with our recipes. Those look delicious, too! I’ll be trying those for the holiday party at work. 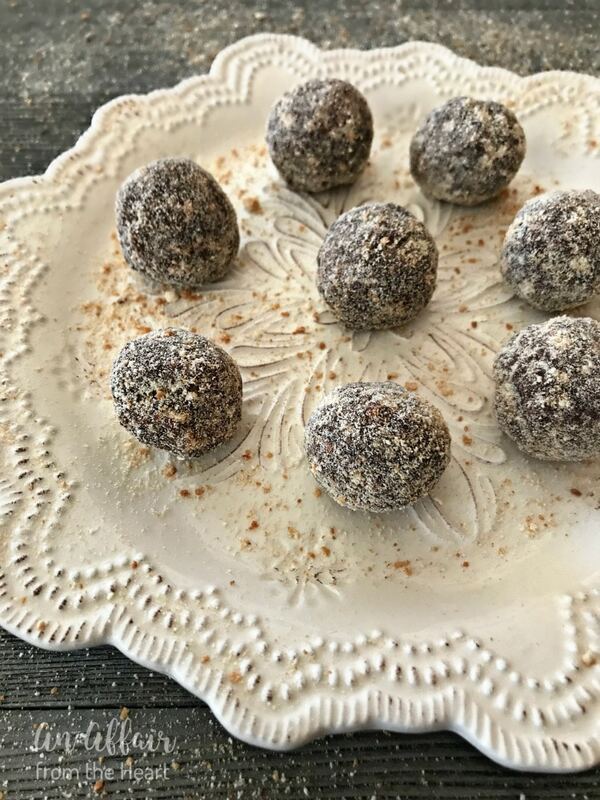 These Rum Balls are going to have to happen in my house. John loves rum and will be super happy if I infuse his sweets with it. Michele is such a sweetie and you definitely picked a winner with this recipe and your photography is amazing! Loving everything about this one! I love Her blog as well & that cocktail does sound perfect! 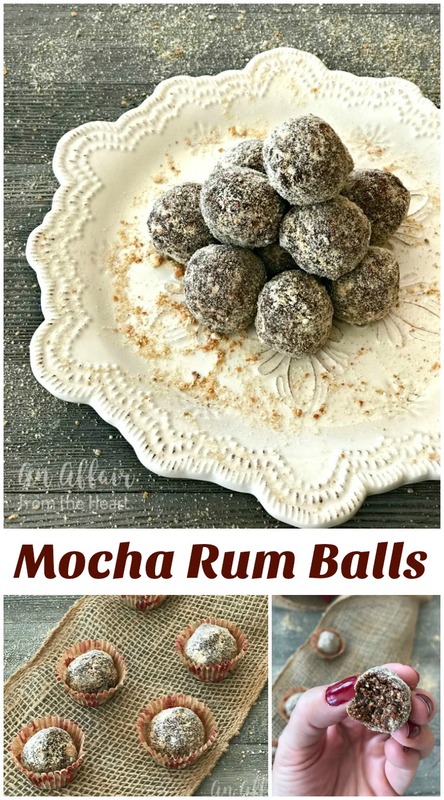 These mocha rum balls, wow!!!! Cannot wait to make a batch! 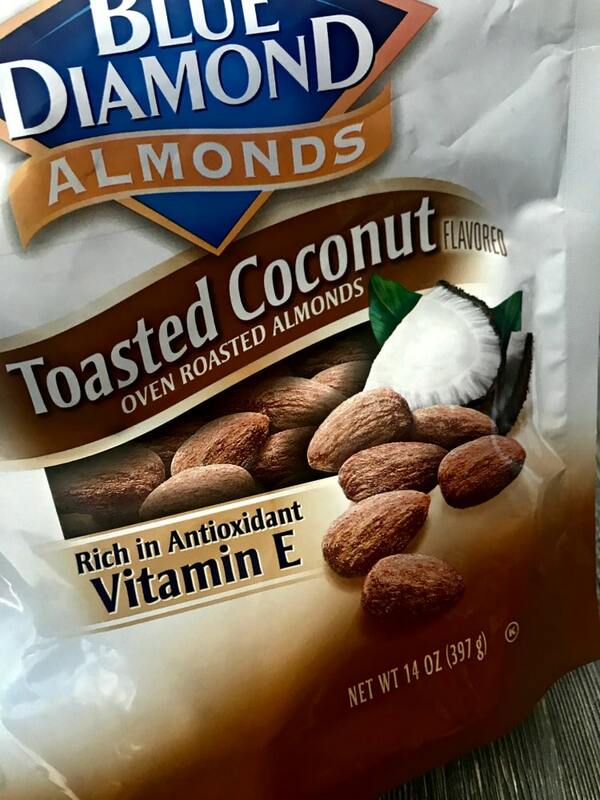 I need to keep an eye out for those toasted coconut almonds – those look amazing! I love these vanilla wafer no bake cookies! So fun & so yummy. Yours are beautiful! ooh, these look so fancy and yummy! Ohhh, love that these are no bake and I have all the ingredients to make these today! Great recipe choice, Michaela! Love the idea of rum and mocha!! These cookies look divine!!! 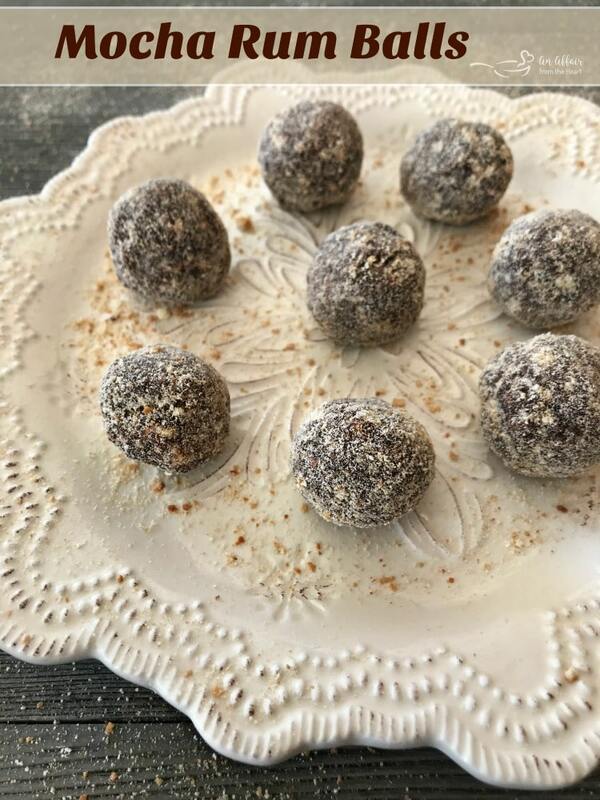 Making rum balls is so much fun 🙂 Love the idea of the mocha flavor! YUM! Just the perfect addition to holiday “cookie” trays. I love having a variety of items, and these sound yummy! Oh yes, I’ll take about 5 of those!! I have to make these ASAP! I love the combination of flavors!